Water purification/Filtration is the process of removing undesirable chemicals, materials, and biological contaminants from contaminated water. The goal is to produce water fit for a specific purpose. Most water is purified for human consumption (drinking water) but water purification may also be designed for a variety of other purposes, including meeting the requirements of medical, pharmacology, chemical and industrial applications. In general the methods used include physical processes such as filtration and sedimentation, biological processes such as slow sand filters or activated sludge, chemical processes such as flocculation and chlorination and the use of electromagnetic radiation such as ultraviolet light. It is not possible to tell whether water is of an appropriate quality by visual examination. Simple procedures such as boiling or the use of a household activated carbon filter are not sufficient for treating all the possible contaminants that may be present in water from an unknown source. Even natural spring water – considered safe for all practical purposes in the 1800s – must now be tested before determining what kind of treatment, if any, is needed. Chemical analysis, while expensive, is the only way to obtain the information necessary for deciding on the appropriate method of purification. According to a 2007 World Health Organization report, 1.1 billion people lack access to an improved drinking water supply, 88% of the 4 billion annual cases of diarrheal disease are attributed to unsafe water and inadequate sanitation and hygiene, and 1.8 million people die from diarrheal diseases each year. The WHO estimates that 94% of these diarrheal cases are preventable through modifications to the environment, including access to safe water. Simple techniques for treating water at home, such as chlorination, filters, and solar disinfection, and storing it in safe containers could save a huge number of lives each year. Reducing deaths from waterborne diseases is a major public health goal in developing countries. Activated carbon is charcoal that has been treated with oxygen to open up millions of tiny pores between the carbon atoms. The treated or activated carbon has a massive surface area (2000 – 3000 square metres per gram of activated carbon) making it highly effective at adsorbing tastes and odours, as well as chlorine and organic colour from water. An activated carbon filter is a filter housing (either a cartridge filter housing or a granular activated carbon media filter is used for activated carbon filtration) containing granular activated carbon or an activated carbon block cartridge. 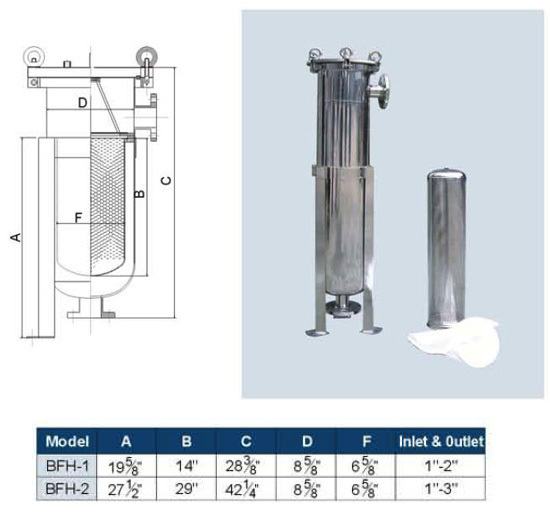 Low flow applications – activated carbon cartridge filters: water flows from the outside of the activated carbon cartridge to the inside of the activated carbon cartridge, through a collector tube, and out to process or the point-of-use. When the activated carbon becomes exhausted, or blocked with suspended matter, the cartridge has to be replaced. High flow applications – Blue Steel Water use conventional multimedia sand filter design, replacing all or a portion of the multimedia filter repack with granular activated carbon. This allows the filter to act as both a sand filter and an activated carbon filter, removing suspended particles, taste and odour, chlorine and organic colour. When the activated carbon becomes blocked with suspended matter, the filter can be backwashed in the same way as a conventional sand filter. When the activated carbon in the filter becomes exhausted, it is usually replaced, although some of the systems we manufacture are fitted with steam sterilization components, to regenerate the activated carbon bed. In short, the KDF redox process works by exchanging electrons with contaminants. This “give and take” of electrons converts many contaminants into harmless components. During this reaction, electrons are transferred between molecules, and new compounds are created. Some harmful contaminants are changed into harmless components. Free chlorine, for instance, is changed into benign, water-soluble chloride salt, which is then carried harmlessly through the water supply. Many heavy metals such as copper, lead, mercury and others, react and bond with the KDF medium’s surface, thus being effectively removed from the water supply. KDF filters are used most often in conjunction with an activated carbon filter. They prolong the life and increase the effectiveness of carbon filters by reducing chlorine build-up. They also supplement the activated carbon filters by removing heavy metals, something that carbon-based filters are not very effective at removing. KDF is also frequently found in home showerhead filters because of its effectiveness at higher operating temperatures and flow rates. What Contaminants Does KDF Remove? KDF process media will reduce or remove chlorine, iron, hydrogen sulfide, lead, mercury, magnesium, and chromium, and may inhibit the growth of bacteria, algae, and fungi. Redox media remove up to 98% of water-soluble cations (positively-charged ions) of lead, mercury, copper, nickel, chromium, and other dissolved metals. While removal rates depend on a number of factors, more than 98% of chlorine is removed by KDF in home water treatment systems (90% in shower water filters due to high flow rate). Multi-media filters represent a significant improvement over single-media filters. This is due primarily to improved filter bed action based on the innovative use and selection of filter media. Multi-media filtration permits delivery of high quality filtered water at much faster flow rates, as compared to a conventional sand filter. In a conventional sand filter, lighter and finer sand particles are found at the top of the filter bed, and coarser, heavier sand particles remain at the bottom after backwashing. Filtration takes place in the top few inches of the filter bed. The multi-media filter is radically different. The multi-media filter bed, in comparison to the sand filter bed, is upside down. Coarse, but lighter, particles backwash to the top, whereas finer, but heavier, particles remain at the bottom of the bed. The innovation lies in the selection of suitable media. This configuration has many advantages. The entire bed acts as a filter, rather than only the top few inches. Turbidity is trapped throughout the bed, enabling the filter to hold far more solids filtered from the water before backwashing is necessary. Typically, the filter bed is made up of three layers of filter media. The total bed depth is about 660 to 1000 millimeters. In a three layer filter the top layer is made up of large, lighter weight particles of anthracite coal and is from 380 to 450 millimeters in depth (particle size 1.0 to 1.5 millimeters, density 1.35 to 1.75). The middle layer contains from 200 to 380 millimeters of heavier and smaller particles of calcined aluminum silicate or sand (particle size 0.5 to 0.6 millimeters, density2.65). The bottom layer contains from 75 to 150 millimeters of heavier garnet (particle size 0.2 to 0.3 millimeters, density 4.0to 4.2). This semiprecious red silicate mineral is 50 to 60% heavier than sand. A multi-media filter is backwashed in the same manner as a sand filter, using reverse or upward flow of water through the filter bed. The various layers of media retain their stratification because each material has a different density. The multi-media filter can operate for much longer periods of time (five or more times as long at the same filtration rate), before backwashing is necessary because the bed can hold more turbidity. Turbidity is trapped and held throughout the entire bed depth, rather than the top one or two inches. Multi-media filtration is much better suited for use in a closed pressure tank since cracking of the bed, and subsequent breakthrough of turbidity is virtually eliminated and the need for visual inspection is unnecessary. The use of pressure tanks, rather than open basins or filters, is an obvious advantage for point-of-use filtration and could also be of real importance in the filtration of small community water supplies. More rapid filtration flow rates in multi-media filtration allow the use of smaller diameter tanks with equal or better results. A very high degree of clarity is achieved in the filtered water because of the fact that the finer particles of garnet at the bottom trap finer turbidity particles. Another important advantage is that the multi-media filter can clarify water at a much higher flow rate than a single-media sand filter (21 to 30 litres per minute, as compared to 6 to 10 litres per minute in a 12 inch diameter tank). This is 54 to 58 lpm per square foot of bed area, as compared to 8 lpm per square foot of bed area. This is a very important difference in the production of filtered water. 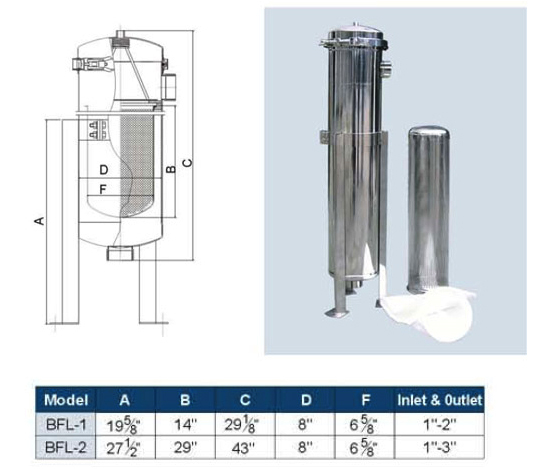 The rapid sand filter or rapid gravity filter is a type of filter used in water purification and is commonly used in municipal drinking water facilities as part of a multiple-stage treatment system. Rapid sand filters were first used in the United States in 1896 and were widely used in large municipal water systems by the 1920s, because they require smaller land areas compared to slow sand filters. Rapid sand filters use relatively coarse sand and other granular media to remove particles and impurities that have been trapped in a floc through the use of flocculation chemicals–typically salts of aluminium or iron. 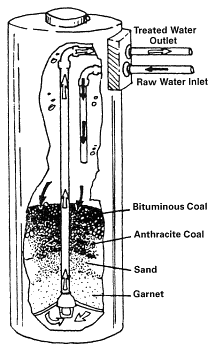 Water and flocs flows through the filter medium under gravity or under pumped pressure and the flocculated material is trapped in the sand matrix. Mixing, flocculation and sedimentation processes are typical treatment stages that precede filtration. Chemical additives, such as coagulants, are often used in conjunction with the filtration system. A disinfection system (typically using chlorine or ozone) is commonly used following filtration. Rapid sand filtration has very little effect on taste and smell and dissolved impurities of drinking water, unless activated carbon is included in the filter medium. Rapid sand filters must be cleaned frequently, often several times a day, by backwashing, which involves reversing the direction of the water and adding compressed air. During backwashing, the bed is fluidized and care must be taken not to wash away the media. Rapid sand filters are typically designed as part of multi-stage treatment systems used by large municipalities. These systems are complex and expensive to operate and maintain, and therefore less suitable for small communities and developing nations. Requires greater maintenance than a slow sand filter. For this reason, it is not usually classed as an “appropriate technology,” as the term is applied in less-developed countries. Generally ineffective against taste and odour problems. Produces large volumes of sludge for disposal. Requires on-going investment in costly flocculation reagents. AFM® stands for Activated Filter Material, a revolutionary filter media made from green glass. AFM® exceeds the performance of quartz and glass sand by filtering about 30 % more organics. 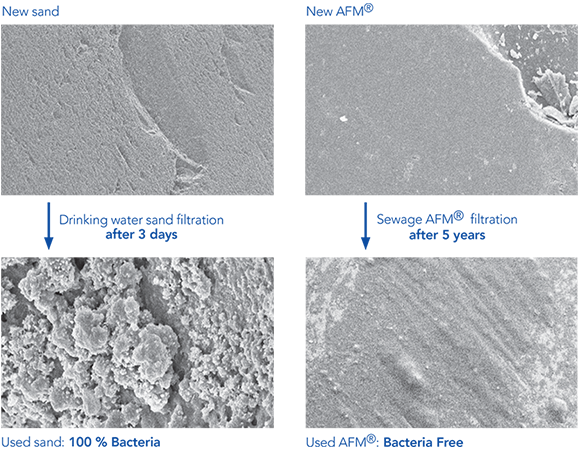 AFM® is bio-resistant and self-sterilising which means no biofilm is formed in the filter bed. This important feature makes the pool system healthier, ecological and more economical. AFM® has successfully been used in over 100‘000 public and private swimming pools worldwide. AFM® is manufactured under ISO 9001-2008 standards and is a filter material certified under European standards for drinking water. Crystal clear water: AFM® filters much finer than quartz or glass sand. At 20 m/hr filtration speed a nominal filtration of 5 microns is achieved without flocculation – AFM® filters at least 30 % more organic substances than fresh quartz or glass sand. With optimised coagulation and flocculation with APF and ZPM, a nominal filtration of less than 0.1 microns can be achieved. Lower chlorine consumption means less secondary chlorine reaction products: chlorine is an excellent disinfectant. But in reaction with organic and inorganic substances it also produces undesirable, harmful reaction by-products such as trichloramine and THM‘s. The more chlorine is consumed the more secondary reaction by-products are produced. With AFM® we can remove far more substances than with sand or glass sand. This applies particularly in connection with coagulation and flocculation. Everything that can be filtered out and removed in backwash process doesn’t have to be oxidised. The better the filtration the lower the chlorine consumption and less disinfection by-products are produced. Bioresistant – no home for bacteria, viruses and other pathogens: sand is a good mechanical filter but it’s also an ideal breeding ground for bacteria. Within just a few days every grain of sand is colonised by bacteria. They immediately form mucus to protect themselves against the disinfectant. In this so-called «biofilm» live entire communities of bacteria and other pathogens – including Legionella. If you have no organic film in your filter there are also no Legionella. No trichloramine and no chlorine smell: the bacteria in the biofilm convert urea into am-monia which then reacts with chlorine to inorganic chloramine (mono, di- and trichlora-mine). Trichloramine causes the unpleasant chlorine smell and is also a severe health hazard. If however, no heterotrophic bacteria are present, urea remains in the water. It reacts with chlorine to the harmless chlorine urea. No biofilm – no trichloramine – no chlorine smells. Filter function remains good with AFM® for many years: No biofilm in the AFM® filter also means no channel formation to disrupt the filter function. Due to filter contamination the performance of a sand filter worsens dramatically after 6 – 12 months despite frequent backwashing. The performance of AFM® remains consistently high for many years. What makes AFM® that effective? Clean Green glass: The raw material used for AFM® has to have a very specific glass quality. AFM® is only made from pure green glass which is the only glass that has the necessary chemical and physical properties to make AFM® self-sterilising. Ideal hydraulic properties: The raw material is broken into the optimal grain size and grain shape. The correct shape is crucial for the outstanding hydraulic characteristics of AFM®. Balls (glass beads or pearls) as well as plates are not suitable for clean water applications. For security reasons, no dangerous glass splinters are allowed to be present in the filter material. Our ISO certified manufacturing process ensures that this is not the case. Activation process: The AFM® activation process creates a mesoporous structure with a huge catalytic surface area. Typically crushed glass or sand has a surface area of 3‘000 m2 per m3 but activated AFM® has a surface area of over 1‘000‘000 m2 per m3 which is over 300 times greater surface area for adsorption and catalytic reactions. Hydroxyl groups on the surface give AFM® a strong negative charge known as the zeta potential that attracts heavy metals and organic molecules. In the presence of oxygen or oxidising agents the catalytic surface generates free radicals that oxidise pollutants and disinfects the surface of AFM®. Crystal clear water – AFM® filters at least 30 % better than silica or glass sand. Lower consumption of chlorine – Everything filtered out does not need to be oxidized by chlorine. The better the filtration, the lower the chlorine demand. No trichloramine – no chlorine smell: AFM® prevents growth of biofilm therefore eliminating trichloramine. No biofilm – no Legionella: Biofilm is a slippery film of bacteria, most of which are friendly, but they provide a home for pathogens such as Legionella, Staphylococcus and (MRSA) Pseudomonas. Chlorine-free systems – AFM® greatly reduces the oxidation demand of the water which makes it perfect for chlorine free systems. The chemistry of the glass, the particle shape and especially the activation process give AFM® these important properties to clearly outperform sand and glass sand filters. The large surface has a strong negative charge to adsorb organics and small particles. The surface also has metal oxide catalysts which produce free radicals and thus a high redox potential. Therefore AFM® is self-dis-infecting. AFM® prevents bacteria from settling to make it a unique, bio-resistant filter material.